It's time for another Stampotique Designers Challenge, this week Valerie is your hostess and she's challenging you to alter a page in a book. This weeks challenge is open to ANY stamp company, but if you have Stampotique images, we'd love to see you use them! Why not play along for your chance to win a $30 Stampotique Gift Certificate, click here for more details. I have to tell you, I had been a little worried about this weeks challenge, I've never really altered a book or page in a book, so this was all new to me. But let me say, I totally enjoyed the creative freedom this challenge gave me. I pulled out a handful of Stampotique images I thought would go well with this weeks challenge, then set out to create my background using a morphed version of the Wrinkle Free Distress Technique by Tim Holtz. To create the BG, I used Ranger Distress Stain in Forest Moss, Wild Honey, Tumbled Glass and Fired Brick, once dry, I stamped the Honey Comb BG in Gesso, then spritzed lightly with Stream Color Wash. The majority of my images are stamped in Ranger Black Archival, the Tree and Mesh BG are stamped in Coffee and Bla Bla Bla was stamped in Vermillion. To add color to the Fence, I painted it with Picket Fence Distress Stain. Sheer and Toby are stamped in Black Archival then colored with Distress Inks. I added some doodles throughout the page with White Gel Pen, and added Scattered Straw Ink to age the page. Thanks to those who took the time to leave a comment on the My Memories Suite Software giveaway - I used Random.org to select the winner....Congrats Niki! Please email me by 8/14 to claim your prize. Lisa - this is fantastic. I really like the colours and design. A really artisitic piece. 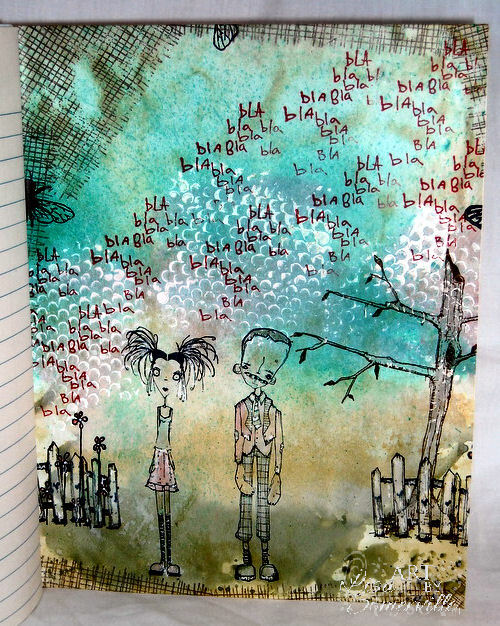 Great page Lisa, and I love the "bla bla bla" :) The Design Team are really pleased that you joined us for the Simon Says Stamp and Show Challenge this week - Thank you! Wow, great techniques, a fun page to look at, so many fun details, awesoe job. What a fab page Lisa! Love the background and the way you fitted the stamps in! Love this and the images are so sweet! Love your altered page! The colors are fantastic. The touches of white in the page are perfect! Beautiful page. At first I thought the "bla's" were birds.... love the way you've arranged those! Lisa, you rocked the altered page challenge! Fabulous design and I love that "Bla, Bla, Bla?" Your journal page turned out fantastic, I love it! Congrats to Niki! Wow Lisa, bla bla bla........this is just fantabulous! I just luv it, you really really are so creative in everything you do! That is awesome! thanks for playing along with us at CCCB! Wow - this is very impressive!!! Stunning work. Love your creation!!! Awesome background page Lisa, love the layering of DS and the splash of Gesso. Lisa, this is amazing and fabulously done! Love looking at it and seeing all the fabulous details! Great altered project! Lisa I love this...love..love thier stamps...I only have two of them..so cool is your background..
Well I have to say this page is awesome.. I can't believe it is your first alter book page.. I just love it.. Thanks so much for playing along with us at CCCB! This is just the COOLEST! Could not LOVE it more! Thanks so much for joining us at CCCB! Lisa, you rocked this challenge!! I'm absolutely positive, this is what my DH hears when I talk about house chores!!! LOL!